Genuine Attestation Services is a leading company that deals in Document Handling, Attestation, Apostille and HRD services. 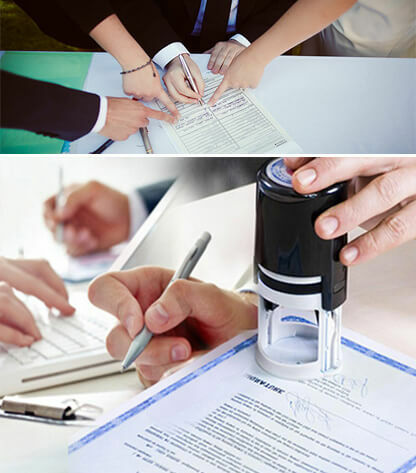 Set of our services include Embassy attestation, HRD attestation, Home Department attestation, MEA attestation, Notary Mantralaya and Apostille stamp for all kind of documents including educational, non-educational and commercial. Our highly skilled professionals are fully knowledgeable about all related aspects of attestation and thus ensure timely completion of process. Being a customer centric company, we keeps customers’ satisfaction as main priority and leave no stone unturned to make this complicated procedure of document attestation hassle free for them. Our document attestation services are extremely authentic, quick and cost effective comprising higher business quality. We know that you submit original documents for attestation and these documents possess great importance for anyone, thus we make sure that your documents remain fully secure with us until and unless they get attested and reach your hands back after attestation. These days, authenticated documents plays a major role while performing any legal activity, either it’s about admission of your kid in school or travelling to abroad for employment or higher studies. Lots of people travel from one nation to another for different reasons, but one thing that is crucial to perform for all is attestation of documents (education, non-educational or commercial). If in case, your documents are not verified properly from authorized regulatory then you may face difficulty in the foreign nation.